It’s almost Thanksgiving and most of My Vacation Lady’s winter honeymooners have booked their honeymoons but we’re still working with some couples that are a bit late in the planning. What are My Vacation Lady’s top 5 winter honeymoon destinations for 2017-2018? In additional to tropical weather year round, the Hawaiian Islands are diverse. Each of the 4 main islands is so different. With so much to see and do, Hawaii is the perfect destination for honeymooners who want to relax on the beach, drive around and explore on their own, eat great food, in a tropical paradise while still in the US. The nation’s southern beaches, like Phuket and Koh Samui, are stunningly beautiful. Combine that with the culture of Chiang Mai and Bangkok and the great value for Americans, Thailand is a great winter honeymoon destination. 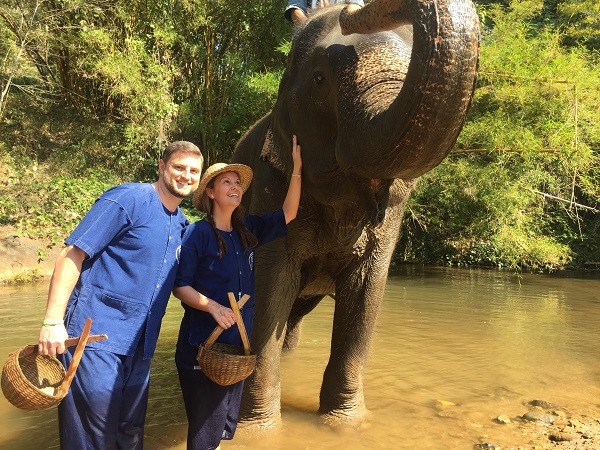 One of our couples’ favorite experiences is to spend a day at an elephant sanctuary. Australia and New Zealand’s seasons are reversed from ours so our winter is their summer. If you are making the trip to Down Under, it makes sense to spend a few weeks exploring multiple cities in each island nation. In Australia, you can go surfing on Bondi Beach, diving in the Great Barrier Reef, enjoy wineries in the Barossa Valley near Adelaide. While you can certainly spend 3 weeks alone in Australia, many of our clients like to try to visit New Zealand as well. Auckland in the north can be used as a base for food, wine and culture. The southern island (Queenstown) is the active adventure destination– speed boats, bungee jumping, heli hikes on glaciers. The winter months are the best time of the year to go to the Caribbean islands and the Caribbean coast of Mexico (Cancun, Playa Mujeres and the Riviera Maya). Our honeymooners are heading to St Lucia, Jamaica, Punta Cana and Mexico all winter long. Beautiful beaches may be the draw but many of the all inclusive resorts offer wonderful honeymoon amenities to make our clients’ honeymoons even more special! This year, we have a good number of clients heading to Costa Rica for their winter honeymoons. Manual Antonio has beautiful white sand beaches, while the Guanacaste region has white to gray to black sand beaches. La Fortuna and Arenal Volcano offer activities that you won’t find in many other regions that are so close. Most of our clients will combine the volcano area hotel with a beach resort for a unique honeymoon experience. My Vacation Lady is the top honeymoon specialist located in New Jersey on both Wedding Wire and the Knot. Our team can help design the honeymoon that you’ve dreamed about. We won’t be the first to tell you that your honeymoon should be special but we are the right honeymoon specialists to make is special.